Hell's Kitchen has long recovered from its reputation as a Manhattan slum to become a great residential nabe. Some folks in the area have tried to re-brand this nabe “Clinton,” but locals are holding on to the “Hell's Kitchen” name (it's so much cooler, eh?). The area's apartment blocks and highrises are still a draw for actors, given the nabe's proximity to the Theatre District and its mystique as a home to thespians. Hell's Kitchen has excellent casual dining, and enjoys culture and shopping opportunities provided by nearby Chelsea and Midtown. A reputation for being un-trendy. So why do I love it? 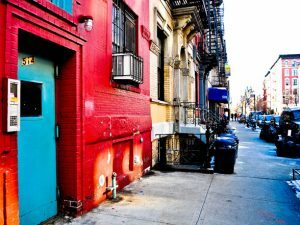 I sort of fell into Hell’s Kitchen when I first moved to New York – a neighborhood I had a love-hate relationship with when I touched down in August 2008. Now, I mostly love it. Before settling into the city, I happened to meet someone through NYU’s housing network who was looking for a roommate in a dingy fourth-floor walk-up apartment on 49th and 9th. I have since moved with the same roommate (and an additional one found on craigslist) into a luxury apartment building with magnificent views of the Hudson, Empire State Building and the Statue of Liberty – I guess you could say I’ve experienced the range of what Hell’s Kitchen has to offer. For most “trendy” people (read: hipsters) living in New York, anything above 14th Street is considered ultra lame. Midtown is touristy, dirty and generally uncool. I can attest to the fact that Hell’s Kitchen is a little too close to Time’s Square, a little too kitschy and, well, stinky (especially in the summer). First, the food. One of my favorite restaurants in New York is right next door to my first apartment on 49th – Pam Real Thai. If you want authentic, flavorful, and cheap thai food, you can’t go wrong with Pam. I still order from there despite the slew of Thai restaurants much closer to my current pad. There is also a hole-in-the-wall, family-owned Lebanese joint (think: home made pita, home made stuffed grape leaves, home made cheese and spinach pies…Apparently the only authentic Druze cuisine in the city) called Gazala place (http://gazalaplace.com) on 9th avenue near 48th. In terms of groceries (namely, fresh produce) you simply can’t go wrong with the Stiles farmer’s market (9th Ave. between 41st and 42nd, also on 53rd between 8th and 9th). Ridiculously fresh and cheap fruits and veggies, I shop there several times a week and it’s a breath of fresh air when compared with the over-priced, low quality food you find at the Food Emporium. Second, its proximity to Broadway. Yes, Times Square is a major buzzkill, but being so close to all of the theaters is undeniably beneficial when seeking last minute Broadway deals, especially when you have guests visiting from out of town. I have popped into many a theater an hour or two before showtime and have come across some great deals that I probably wouldn’t have otherwise gotten if I lived in an arguably cooler neighborhood downtown. Just this past weekend when my mom was visiting, we walked by the box office for “Promises, Promises” and were offered free orchestra seats for that day’s performance by a woman whose friends couldn’t make it to the show. Third, access. You can’t beat a 15 or so minute walk to Central Park,a 10 minute walk to the Hudson River Park, a five to 10 minute walk to just about every subway line in Times Square, and an easy stroll to Port Authority where express buses take you to any of the three airports at affordable prices. Which brings me to my last point: affordability. Myself and my two roommates split a gorgeous, brand new apartment on the 32nd floor of a 43rd St. luxury building for $3500 a month. (I pay $1000 for my room, which is the smallest.) Our building has a gym, hosts regular cocktail parties and spa days for its residents and even offers free yoga classes Monday nights. For that price, I could probably be living in a roach-infested hole with an air shaft for a window in the oh-so-cool east village, if I wanted to. So, is Hell’s Kitchen the hippest (or cleanest…) of places? No. But for a mid-twenties girl such as myself, who is more concerned with practicality and price than trying so very hard to be cool, it does the trick. I have been living in Hell’s Kitchen for about 3 years now, specifically off of 12th Avenue. 9th ave has a ton of good places to eat and all of the regular conveniences. The challenge with the area is that most of the nicer buildings are further west than 9th on 11th and 12th, which makes it a long walk to the subway, though once you get to 7th or 8th you pretty much can get anywhere you need very easily. The neighborhood doesnt have the charm of other areas in the city (i.e. west village) but overall isnt a bad place to live. Also known as Clinton, this once low-rise area is welcoming new luxury condos. With access to the subways at Times Square, Hudson River views and up-and-coming restaurants, this neighborhood is slowly becoming more and more trendy. However, Times Square is a giant pain. If you are a resident of the city, it is easy to get fed up with the idling tourists meandering through the neighborhood that they think is iconic of New York, which it is not. And unfortunately the only way to access Clinton is to walk through the madness of overpriced chain restaurants and the matinee crowd.Beverly W.
Hell’s Kitchen really has two faces. The blocks of 42nd street (9th and 10th avenues) and above are full of restaurants, bars, and generally a lot of activity. The area below 42nd street is a lot more industrial/gritty, with new rental high-rises springing up every few months. Overall, an amazing neighborhood to live in because of its proximity to Central Park for nature lovers and the nightlife liveliness of the Chelsea, the Meatpacking District, and the West Village. It’s also relatively cheaper than the more popular neighborhoods immediately above or below its borders. For those who love to cycle, the area has amazing access to both the bike paths along the West Side Hwy and those of Central Park. While some years off, the Hudson Yards project and the new 7 train train station near Jacob Javits Center are expected to propel this area to one of the more exclusive neighborhoods in NYC. Dining, rent prices, laid back attitude. When I was 18 years old in 1981 I had my first big girl apartment in Hell’s Kitchen. The neighborhood was changing but it still had some edge to it. I lived in a walk up that looks old and run down on the outside but on the inside it was renovated and was unique and edgy like the neighborhood. It was beautiful and spacious. It had a fire place and loft beds and brick walls. I got cheap rent because I cat sat for an actor who was in a Broadway touring company. It was an amazing time in my life and some of the best memories of my youth were in Hell’s Kitchen. Hell’s Kitchen did not fully change until World Wide Plaza was built in 1989. For some reason I do not have any pictures from that apartment or time in my life. I must have lost them along the way. I still love this neighborhood. And I still have friends who live and work there and have some wonderful memories of Hell’s Kitchen and the people there. We still eat there from time to time. During the 1950s, immigrants, notably Puerto Ricans, moved into the neighborhood. The conflict between the Irish, Italians, and the Puerto Ricans is highlighted in West Side Story. When I lived there, there were many Puerto Rican break dancers and block party’s. I always had a blast! Hell’s Kitchen had and still has a little bit of it’s original energy. More recently Hells’ Kitchen’s diverse immigrant heritage has led to some great ethnic restaurants. Unlike other NYC neighborhoods that hipsters have moved to they have not changed Hell’s Kitchen but Hell’s Kitchen has changed them as it should be. Mario Puzo (1920-1999), author of The Godfather. Illusionist and endurance artist David Blaine lived in Hell’s Kitchen for several years. Actor Tom Hanks had an apartment in Hell’s Kitchen in the late 1970s/early 80s. 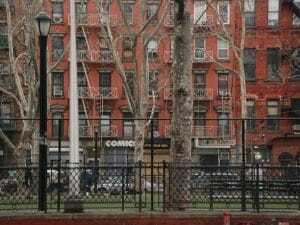 Some famous mobster’s have lived in Hell’s Kitchen as well. While every New Yorker knows where Hell’s Kitchen is, don’t expect to find it’s location in print. The yellow-bordered map in the back of cabs refers to the area as Clinton while the MTASubway map refuses to name it. There is so much I could say about the history of Hell’s Kitchen but to keep it as brief as possible I will stick to the current Hell’s Kitchen. The neighborhood is still one of my favorites in NYC. It still has a great energy to it and for tourists who are visiting Broadway just walk over to Hell’s Kitchen to eat. Don’t eat in Times Square. Hell’s Kitchen is also home to the famous Manhattan Plaza. http://en.wikipedia.or… famous actors have lived there as well. It is cheap housing for actors who are just starting out. They have everything there it is like a city within a city. Hell’s Kitchen is always evolving. But unlike other NYC neighborhoods it still maintains some of it’s NYC flavor. I love takeout and casual dining. I’ve never been as drawn to fancy dining for some reason. Hell’s kitchen has soooo many amazing takeout places and little hole-in-the-wall spots. I think the dining and the lower cost would be my main reasons to live in this neighborhood. I moved to HK right out of college. The apartment was a Taxi Driver special: a rent controlled one bedroom converted to two, with a pre-war oven and a roof that leaked when the sun was shining. But this is not indicative of the neighborhood today! Many new affordable high-rises are popping up. Friends have found stakes in doorman apartments for less than $1200/month. In fact, Hell’s Kitchen rivals theFinancial District as the #1 spot for entry level professionals that can’t bear the thought of a walk-up. The dining and drinking options are a mixed bag. Because this nabe sits at the mouth of the Lincoln Tunnel, the weekend crowd can sometimes resemble a casting call for Jersey Shore. And certain spots, like 46th Street, get swarmed before and after Broadway shows. But there are plenty of cute restaurants and bars that cater to locals. If you want some of that old New York grime, 9th Avenue near the low 40’s will sate your appetite. But just 20 blocks north is the Time Warner Center and some of the priciest real estate in Manhattan. Most people find themselves somewhere between these two extremes. The neighborhood is a mixture of families, young working professionals, and seniors living in rent-controlled apartments. There is also a bit of a gay scene, which can make for a fun girls’ night out.Alex P.
Hell’s Kitchen, a neighborhood almost synonymous with the Lincoln Tunnel, Port Authority, and Penn Station. Well, that may have been a decade or two ago, but now the place has cleaned up its act a little and converted some of its gas and grunge into clean, affordable housing and a charming food scene. 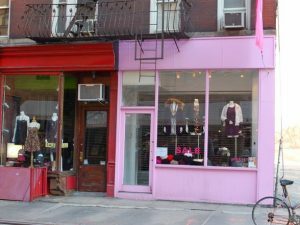 While it’s true that 10th and 11th Avenues are best avoided when the sun dips down, 8th and 9th have developed quite a reputation for hosting a number of delicious and budget-conscious cafes, eateries, and nightlife hotspots. Personal faves include Amy’s Bread, Cara Mia, and the Amish Market but there’s really something for every palate and every budget. And while quite a few corporate types do choose to kick back and relax in one of Hell’s Kitchen’s numerous happy hour venues after hours, the area is also a mecca for the arts in the form of the Westside Theater and the Digital Film Academy. And last but not least, if you’re crunched for cash and want to find a room that airs on the cheap side, Hell’s Kitchen is not a bad place to begin your search. So while the tourists crowd Times Square, feel free to steer clear by putting on your New York power walk and heading west to Hell’s. although my apt’s a little small, I really like the area’s feel. It still has its bite to it, and you get a really great feel from the area. People have major pride in the neighborhood…. 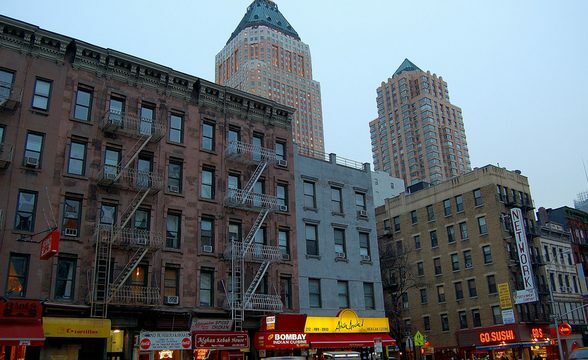 Great nightlife, an awesome place to walk around during the day.Shawn F.
Hell’s Kitchen is a perfect neighborhood for me since I spend a lot of my time checking out the New York arts scene. It’s Chelsea without being Chelsea, andMidtown without being Midtown. Plus it’s a badass place to live.Joe L.